Images and poems about wildlife at the north Norfolk coast. 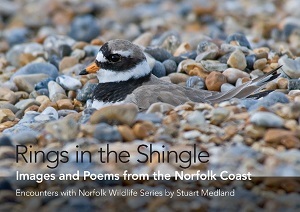 Rings in the Shingle is a sparkling mixture of poetry, prose and colour photography about wildlife you find at the north Norfolk Coast. An enchanting souvenir and gift such that all may bring a bit of Norfolk home. This is the first book in the series of Encounters with Norfolk Wildlife. The second volume is now out: The Worshipful Companies which can be purchased here. …. Medland responds with enthusiasm again and again to what he finds inland (north Norfolk coast) and on the shorelines, and records his personal discoveries in three ways. In his notebook he jots down the scene or incident as it strikes him at the time. Poems develop his response in free verse lyrics which, though quite brief, allow him fuller, more imaginative expression than informal prose. And colour photographs catch the beauty of the moment in images that record the split-second when the bird is still or starts up alone or in a whirling flock. As a poetry philistine it was with some trepidation that I approached this book. I need not have worried. The book is a little gem and much more than a series of poems. It covers 22 species the majority of which are birds but also includes common and grey seals, common blue and white-letter hairstreak butterflies. Each species is presented in three sections: A number of photographs for each species accompanied by a poem and some text outlining the background of the species and photos. My particular favourite photograph is of snow buntings taken at ground level. The first bird is obvious, then it becomes clear there is another bird featured but the last two birds are harder to see. The prose describes how the author crawled up a shingle bank to take the shot. This is just how they are when you encounter them on the shingle beaches in Norfolk; you almost tread on them before they spring into the air and you wonder how you failed to see so many birds right in front of you. The blurry knot photos capture beautifully the seeming chaos of a flock of the birds. Most of the birds covered are evocative, coastal Norfolk species such as ringed plover, oystercatcher, little and Sandwich terns and knot. Others are more common and widespread including skylark (a favourite of poets), linnet and sand martins. This is a great book to dip into one species at a time. The text is not heavy with facts and figures but has interesting anecdotes such as Norfolk skylarks may have inspired Vaughan Williams to revise his famous The Lark Ascending. The photographs add to the ambiance for each species and the prose give an account of the photographic encounter with each species.